A family of "architect" genes called Hox coordinates the formation of organs and limbs during embryonic life. Geneticists from the University of Geneva (UNIGE) and the Swiss Federal Institute of Technology in Lausanne (EPFL), Switzerland, have discovered an essential function of one of these genes, Hoxd3, in the development of the gut of suckling mice. Specific mutations in this gene induce defective breast milk assimilation and important growth retardation. In humans, this genetic defect probably contributes to certain types of intestinal insufficiency in premature infants such as necrotizing enterocolitis. The detection of a mutated Hoxd3 gene would enable physicians to identify one of the causes of this disease, which remain unknown to this day. This work was published in Proceedings of the National Academy of Sciences. The Hox genes are involved in the emergence of the digestive system during embryonic development. A group led by Denis Duboule, professor at the Department of Genetics and Evolution of the UNIGE Faculty of Science and at the EPFL, has discovered many functions and modes of action of these architect genes over the last 30 years. "We have observed cases of delayed postnatal growth in pups carrying mutations in the HoxD gene group, and we wanted to determine their precise causes," says the researcher. His team has produced several lines of mice carrying precise and targeted mutations in the HoxD gene cluster. "All of the pups carrying a Hoxd3 gene coding for a dysfunctional protein were severely stunted during the suckling period and displayed abnormal development of the small intestine," explains Jozsef Zakany, researcher at the Department of Genetics and Evolution and first author of the study. 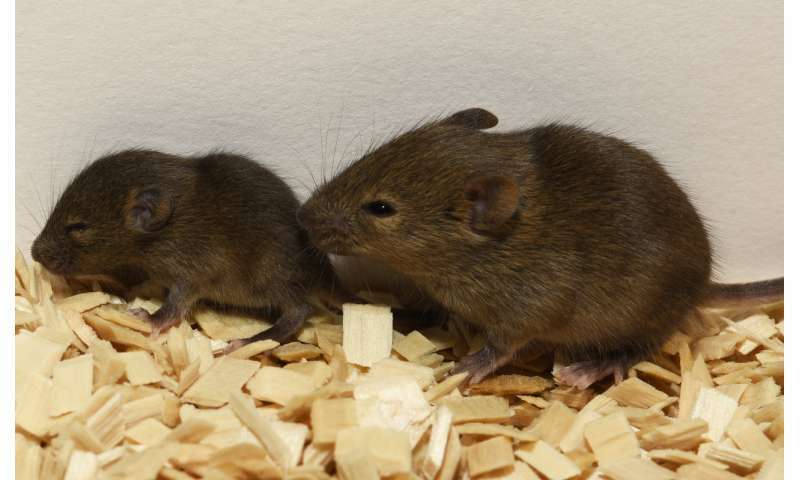 This gene therefore has a crucial role in the developing gut of suckling mice. Unlike adults, mammalian babies "eat" milk, incorporating it as undigested droplets. "The Hoxd3 gene appears to promote the maintenance of the intestinal cells responsible for absorbing this nutrient throughout the suckling period. Growth has, indeed, systematically resumed in surviving mutated animals, reflecting changes in the intestinal wall following weaning," notes Jozsef Zakany. The human and murine genomes are similar, including the genes of the HoxD complex. The same applies to their physiology of nursing. According to the researchers, the presence of a Hoxd3 gene displaying this kind of mutation probably contributes to certain types of intestinal insufficiency in premature infants, such as necrotizing enterocolitis of the newborn. This affliction, which varies from 4 to 22 percent in babies with very low birth weight requires rapid diagnosis and urgent medical care. "In less than a week, it is possible to test the DNA of infants suspected of having such intestinal insufficiency to detect a possible mutation of the Hoxd3 gene. This is a path to be explored at the clinical level, as the causes of this disease are still unknown," concludes Denis Duboule.